Every community needs a space where people feel safe, free to share their thoughts through dialogue, learn valuable interpersonal and group skills, and have access to good food and drink. 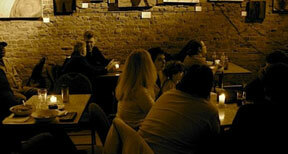 This is the basis of "peace cafés", an initiative started by peace education NGO Canadian Centres for Teaching Peace. Each peace café is owned and managed locally -- may be for-profit or not-for-profit, sources its food and drink ethically and responsibly. They are community spaces with a welcoming atmosphere to visitors and customers alike; spaces where local peace and social justice groups might meet, where grassroots community organizing may begin. When a café joins the family of peace cafés, the terms are simple: adopt the UN Manifesto 2000 for a Culture of Peace and Non-violence as a statement of values. “In 2006 I had a class assignment to give away something I loved. 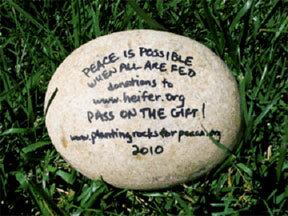 I chose to give away a rock I had designed with the word, "Peace," on it. I placed the rock on a post outside a beautiful field with the word "Peace" facing towards the field where I thought anyone could surely find peace. I hoped the rock would be a catalyst for people having a thought (or many thoughts) about peace that rippled out into the universe. Twenty four hours later someone had turned the rock around, facing outside the field. I don't know if the person who turned the rock around did so consciously, as if to say, "Take the Peace with you when you leave." I do know that it gave me a lot of joy to think that he or she wanted others to take that message of peace with them out of the field and into their daily lives. It was a simple but powerful gesture. It inspired me to write a lesson plan for kids called "Planting Rocks for Peace" which, much to my surprise, was posted on the International Day of Peace website. It inspired me to design many more peace rocks which I "planted" in trees and on fences around the perimeter of the field to provide a kind of peace walk to celebrate the International Day of Peace. 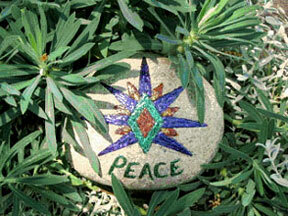 It inspired the website, www.plantingrocksforpeace.org dedicated to helping bring peace in our lifetime. Last year, I've started writing on the backs of them: "Peace is possible when all are fed. Donations to www.heifer.org. Pass on the gift!" So not only are the rocks a catalyst for thoughts of peace, but hopefully there are some donations to Heifer International to help end world hunger. With 100 Projects for Peace, Kathryn Wasserman Davis, a lifelong internationalist and philanthropist, has established a nationwide competition to recognize and reward the creation of innovative peace projects and assist their implementation. Now in its fourth year, the project is an invitation to undergraduates at the American colleges and universities in the Davis United World College Scholars Program to design grassroots projects that they will implement during the summer. The 100 projects judged to be the most promising and achievable will be funded at $10,000 each. The objective is to encourage and support today's motivated youth to create and try out their own ideas for building peace. Upon the occasion of her 100th birthday in February of 2007, Mrs. Davis, mother of Shelby M.C. Davis who funds the Davis UWC Scholars Program, chose to celebrate by committing $1 million in funding for one hundred Projects for Peace. “I want to use my 100th birthday to help young people launch some immediate initiatives - things that they can do during the summer of 2007 - that will bring new thinking to the prospects of peace in the world,” says Mrs. Davis. Because of the many marvelous achievements made by students since the summer of 2007, Mrs. Davis is continuing the Davis Projects for Peace for the summer of 2010. This year’s approved proposals include a plethora of projects to be implemented in all corners of the globe, from Afghanistan to Nicaragua to Tajikistan and Zambia. The project ideas are diverse in purpose and range from discovering the “Art of Aging” in Turkey, supporting young writers in Kenya, painting peace in Nepal, staging performances with leprosy-affected youth in India, promoting peace in Ugandan refugee camps, providing clean drinking water in rural China, investigating Islamophobia in France, to teaching youth in Guatemala about the 36-year civil war. They cover issues from empowerment of women, to environmental concerns to peace education and intercultural dialogue.